Supporting the Mayor of London's pledge to turn the city into the electric vehicle capital of Europe, Hertz have launched a revolutionary range of electric cars for hire from our Marble Arch branch. 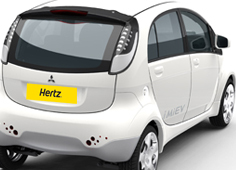 So you can now travel around London knowing you have the eco friendly choice with Hertz. Renting our electric cars gives you the comfort of getting around London with the knowledge you're producing zero CO2 emissions and significantly lower noise pollution than any regular car. What's more, all our electric cars are exclusively exempt from the London congestion charging zones, so not only are you doing your bit for the environment, you're saving some cash too. Our electric cars have a range of over 90 miles, and with over 16 charging stations around London, this revolutionary rental scheme is the practical travel solution for the environmentally concious.